Here’s the link to a new review and video review comparing the Nook Color vs the BlackBerry PlayBook, two of the top 7″ tablets on the current market on two different ends of the tablet spectrum. One is budget and one is business. The Nook Color is focused on e-reading, and can be transformed into a decent Android tablet. 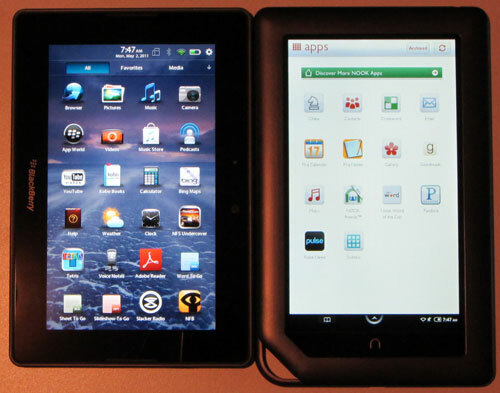 The PlayBook has everything a tablet requires to be successful, but is very new and lacks native applications. Hit the review for the head to head comparison. There are overclock kernels you can apply to the Nook to get the processor to run above its set speed, which is 800MHz. I think it can go higher than 1.2 now but I don’t think it’s as stable. They are over on the XDA forums in the Nook Color Android Development thread. Here’s the post for the 1.2GHz kernel. It says it works with CM7. I haven’t tried it.